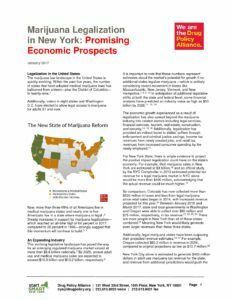 There is ample evidence to project the positive impact legalization could have on the New York state’s economy. For example, illicit marijuana sales in New York are estimated at $3 billion,18 and an official study by the NYC Comptroller in 2013 estimated potential tax revenue for a legal marijuana market in NYC alone would be more than $400 million, acknowledging that the actual revenue could be much higher. There is no reason why New York, a global economic powerhouse, should not be able to provide its residents with the same opportunities that are being afforded to individuals in states that are generating millions of dollars in revenue from legalization.